Todays words are rough, grungy, unfinished and unsettling. 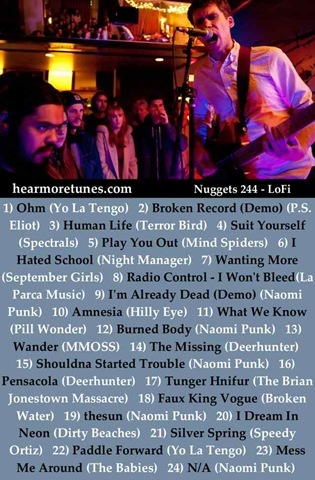 This mix combines some bands that are new to me with some of the usual suspects. That’s Naomi Punk on the cover and there’s four tracks in the mix to savour. Born out of the DIY grunge/punk scene in Seattle/Olympia Washington, Naomi Punk channels the sound of their punk ancestry through warped and strident guitars, beautifully jarring hooks, and heavy tribal drums. It’s hard to wrap your head around it all, but it’s guaranteed to blast your skull apart. The trio–comprised of Travis Benjamin Coster, Neil Gregorson, and Nicolas Luempert–are childhood friends who grew up just outside Seattle. Coster is currently living in Seattle, making music and art, and Gregorson and Luempert are studying music/art at Evergreen State College in Olympia. After playing in several independent projects (U, Masters and Johnson, Seahouse) they formed Naomi Punk. Their first record, The Feeling was released in April 2012 on Vancouver’s Couple Skate Records, and re-released by Brooklyn’s Captured Tracks in October 2012. The Feeling is one of the year’s most original in the punk/DIY/best-new-band-on-the-planet category. We were fortunate to have Naomi Punk lay down a killer session just before they played a sold out show at Music Hall of Williamsburg with Calvin Love and Mac DeMarco, and then we saw them again at the Savannah Stopover Festival in Savannah and they blew our minds completely apart. Watch Naomi Punk perform “The Spell” and”Burned Body” off The Feeling as well as a new song, “Television Man,” [below]. The mix starts off with Yo La Tengo from their latest album, Fade. Its good to see them rocking on – 30 years of making music! There’s also tracks from the new Deerhunter album – Monomania – which I am still absorbing. Almost all the tracks are up so those blessed with a web browser that speaks Flash, enjoy.